Nice costume! You look good as a modern stylish vampire. I also wore a LBD as part of my costume (witch). I was fortunate enough to get invited to a party this year. Had a really good time. And people liked my costume. Some knew about my femme side and some didn't, but it didn't matter. I love the outfit and I like the vampire look for Halloween. I may give that a try some year. This year we had to watch the World Series and I was still not feeling well so no outing for me. Those teeth are terrifying!!! But great outfit! 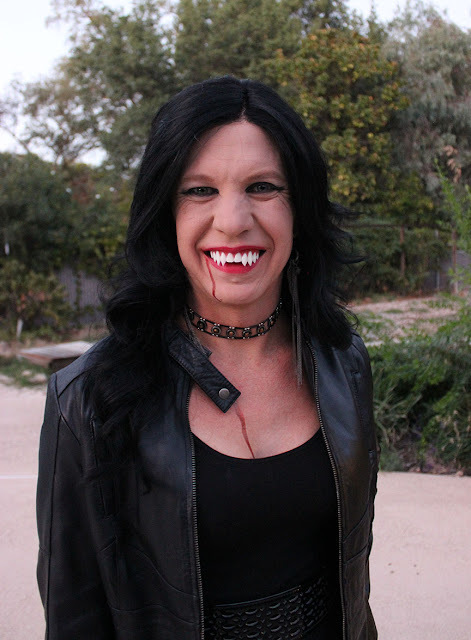 You look like you could be on True Blood!